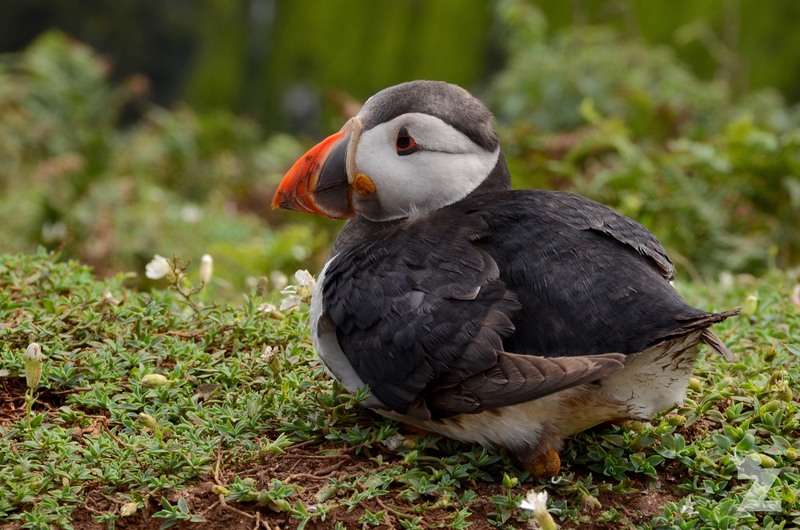 There are actually three species of puffin: the tufted puffin (Fratercula cirrhata), the horned puffin (F. corniculata), and the Atlantic puffin (F. arctica). Many of us are most familiar with the Atlantic puffin, the species pictured in this post. The Atlantic puffin is found in the North Atlantic Ocean, whilst the other two species are found in the North Pacific Ocean. The Atlantic puffin, which for the remainder of this post I shall just refer to as the ‘puffin’, is list as ‘vunerable’ on the IUCN Red List as it’s populations have experienced rapid declines across its European range. The large red and grey scutes (horny plates) together with the fleshy yellow rosette in the corner of the mouth are grown late winter for use in display. After the breeding season they are moulted. The winter bill is relatively small and constricted at the base, and blackish in colour. The face is also blackish. In size and appearance, the egg closely resembles a white hen’s egg and is incubated by the parent birds in turn for about six weeks. Once hatched, the chick stays in the burrow for about six weeks. Both parents bring food to the chick, with the most common item being sandeels (a small fish larvae). The parents these catch by diving. Once they’ve caught a sandeel, they hold it between their tongue and upper mandible. This allows the puffin to catch another, and another, and another! 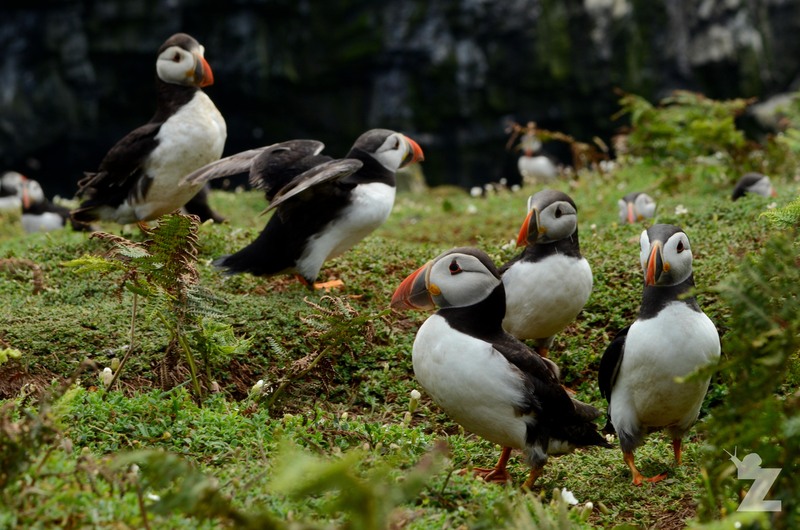 On Skomer Island, the normal number of fish carried back to the nest at each visit is about 10. But, as I mentioned above, the world record is 80. This was recorded on an island in northern Norway. A beautiful painting of a puffin with a beak full of sandeels by artist, Alan Ward. You can purchase this print and view his work here. 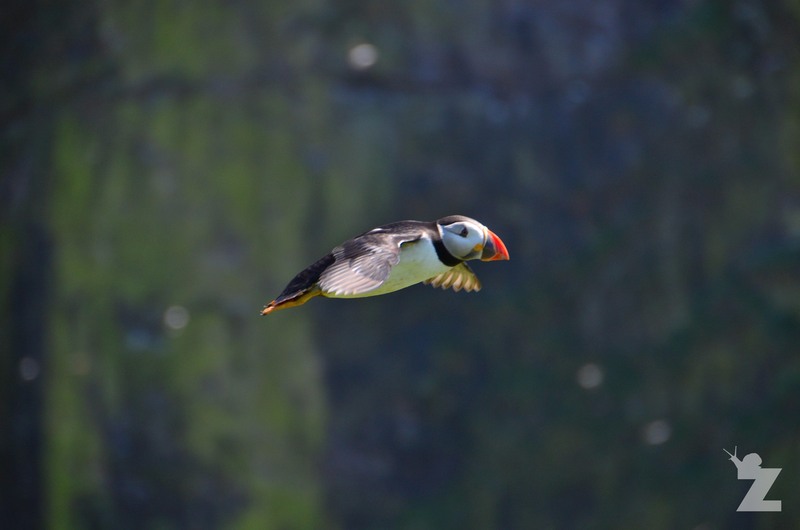 Almost no first-year puffins make land-fall at the nesting colonies. From the age of two onwards, the young birds spend more and more time at the colony in summer, looking for a mate and and searching for a burrow. Puffins usually reach breeding age at 5-6 years old, and often live for 20 years. Some birds can live much longer though. 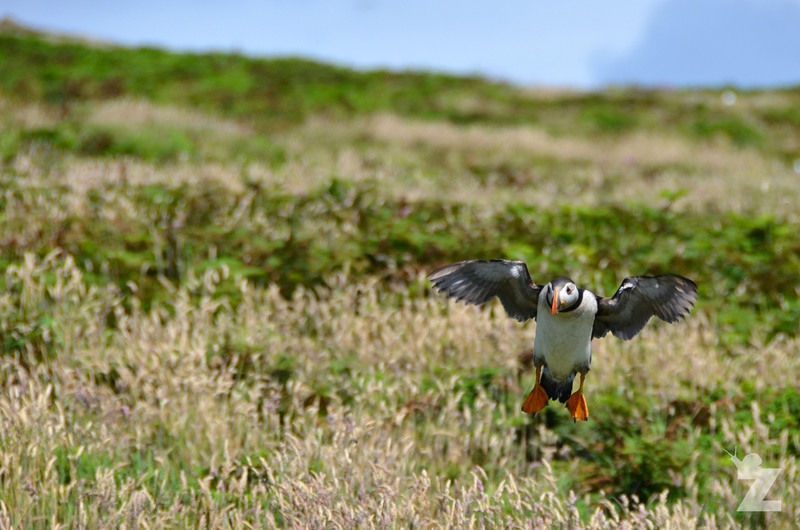 The current record on Skomer Island is more than 38 years! Puffinus puffinus is actually the Latin name for the Manx shearwater, a seabird in the completely unrelated family, Procellariidae. ‘Manx shearwaters’ were actually called ‘Manks puffins’ in the 17th century. ‘Puffin’ and its variants, such as ‘poffin’, ‘pophyn’ and ‘puffing’, referred to the cured carcass of the fat nestling of the shearwater which was once a delicacy. The Atlantic puffin acquired the name much later, possibly because of its similar nesting habits. For more fun facts and interesting info, check out our ‘References and Further Reading’ section below. Next Post Sphingids of Spain: Is That a Hummingbird? No, It’s a Hawk-moth! Quite interesting facts, thanks for sharing!